This database contains details of British deaths during the Palestine conflict 1945-1948. There are some officials and policeman also included but not the full quota. This does not mean that there are not anomalies, that entries have not been duplicate or that the information here is 100% accurate, please let us know if you have facts we have wrong or not available. Members of the Irgun, dressed as Arabs, set off a bomb in the King David Hotel in Jerusalem, which had been the base for the British Secretariat, the military command and a branch of the Criminal Investigation Division (police). Ninety-one people were killed, most of them staff of the secretariat and the hotel: 28 British, 41 Arab, 17 Jewish, and 5 other. Around 45 people were injured. Son of Charles Thomas Adams and Alice Adams; husband of Florence Lucy Adams, of Brondesbury Park, Middlesex. At Kefar Sirkin, at 07:30 hours a pressure-type mine was found on the railway line. A Royal Engineers party from 2 Para Brigade undertook disposal. Captain Adamson, 9 Airborne Squadron Royal Engineers, was seriously injured and died later. Son of William Edward and Winifred Ainsworth, of Wigston, Leicestershire. Son of George and Mary Alcorn, of Port Glasgow, Renfrewshire. Son of Arthur James Alexander and Lizzie V. Alexander, of Dudley, Worcestershire. Killed in Jerusalem around 11:19 hours near the Jewish Agency in King George Avenue, when automatic fire was directed at a Royal Air Force 15 cwt truck, the two occupants of the vehicle sustaining bullet wounds from which they died in hospital. During the evening of 16th June 1946, Hagana carried out attacks on road and rail bridges on the frontier of Palestine, causing damage estimated at L250,000. Four road and four rail bridges were destroyed during the night, and one road bridge across the Jordan was destroyed by a delayed action mine, while attempts were being made to remove the charges. Lieutenant Allen of the Royal Engineers was killed by the explosion. Son of William Gordon and Dora Mary Allen, of West Mersea, Essex. Killed at 11:25 hours when a military truck blew up apparently as result of time bomb placed in vehicle in front of Military Headquarters, Sarafand. Son of Hugh and Catherine Walker Kirkpatrick, of South Norwood, Surrey. Shot at close range while walking in one of the main streets of Tel Aviv. Son of C. P. Andersen and Marie Andersen, of Copenhagen, Denmark. Son of Mr. and Mrs. L. Anderson; husband of Jean Anderson, of Hull. Son of Henry and Ida Appleby, of Short Heath, Willenshall, Staffordshire. Killed during a Jewish attach on an African coloured soldiers' camp near the township of Holon. Son of Dr. Thomas E. Ashley and Muriel Ashley, of Bristol; husband of Leela Rukmini Ashley (nee Reddy), of Stoke Bishop, Bristol. Killed when travelling on the Cairo-Haifa train that was mined north of Rehoboth. The train was carrying troops into Palestine on return from leave or on duty visits. Son of Victor Herbert and Eileen Sarah Ayliffe, of Bishops Stortford, Hertfordshire. Son of Andrea and Doris Azzopardi, of Tynemouth, Northumberland. Son of Thomas and Sarah Agnes Wormald, of Chipstone, Nottinghamshire. Son of Frederick Edward and Margaret Baker, of Luton, Bedfordshire. Son of William Francis and Florence Baker, of Barnton, Cheshire. At 17:10 hours, 12 January, a truck entered the compound of Headquarters District Police, Haifa. The guardchecked the identity of the driver who parked the truck outside the canteen. The guard became suspicious and the truck was searched. On discovering a bomb in the back of the vehicle, orders were given to evacuate the building. A few minutes later the bomb exploded, killing two British constables and two Arab TACs, and injuring a considerable number of Police personnel and civilians. Son of Mr. and Mrs. James Ballantyne, of West Wylam, Northumberland. See also Britain's Small Wars - Palestine for explanations of events. Other sources include Wikipedia for the King David Hotel Bombing, the London Gazette On-Line for awards and officers advancement. Details have also been drawn from The Times Newspaper Archive. See also Encyclopedia of the Palestine Problem. 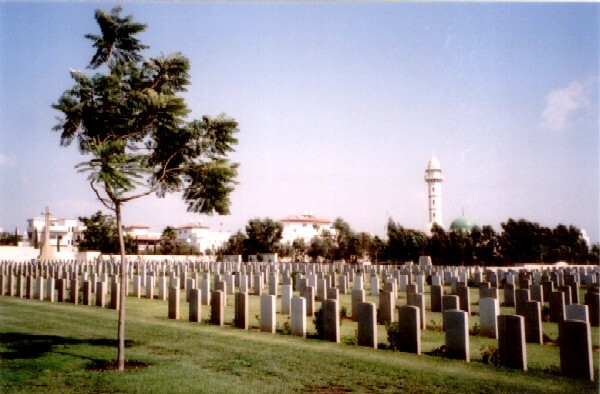 Most of those who died are either buried in Ramleh War Cemetery, Israel, Jerusalem Protestant Cemetery, Israel, Sharon British Civil Cemetery, Haifa, Israel or Khayat Beach War Cemetery, Israel. Details for those who died have been extracted from the Commonwealth War Graves Commission web site for 1945 to 1947. See also Palestine Police Old Comrades Association, Wikipedia - Palestine Police and Palestine Remembered.